This is a terrible photo for colour accuracy, but shows the latest of my experiments in tablet weaving. It’s quite narrow (6mm) and the cotton is a bit shiny, so it’s a little hard to photograph well. In my description of how the twisting of the warp yarn works in tablet/card weaving, I mentioned it created a warp-faced weave. 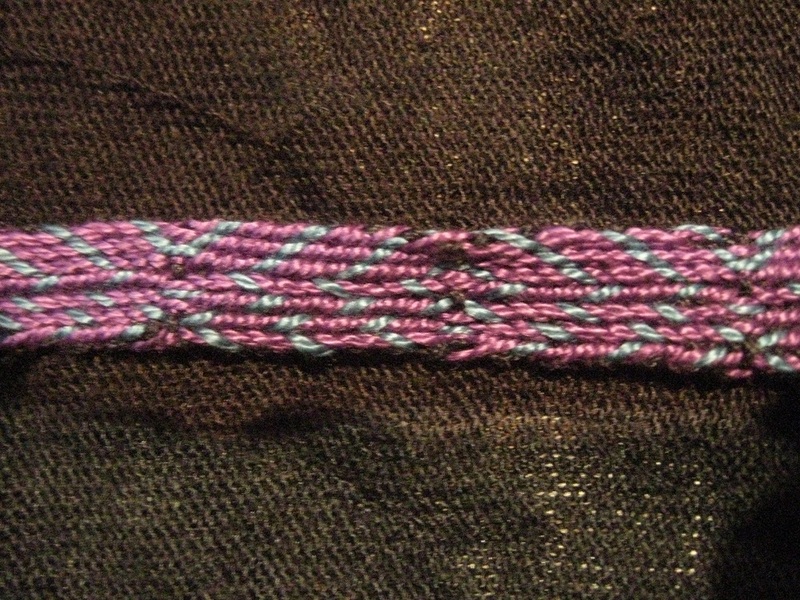 In this sample you can make out just the odd spot of dark weft showing through the purple and teal warp (that’s what the colours are supposed to be!). All the rest of the weft is hidden inside the twists. This was created by having three holes in each tablet/card threaded with the purple and one teal. During set up I turned each card so that the teal thread was one position further away on each card, as this gives you the > shape as you weave (called chevrons). The teal thread on each card is only visible every four picks/four turns. The direction of the chevrons was altered by changing the direction I rotated the tablets in, starting by turning them away from me and then turning them toward me. It’s a bit lumpy where I changed direction, so I still haven’t gotten that quite right! Still, I like the result in such pretty thread.